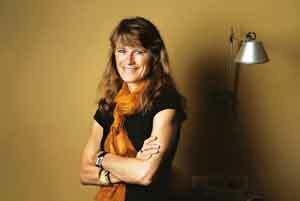 Mumbai: The Economist has described Jacqueline Novogratz as the “patient capitalist". The 48-year-old founder and chief executive (CEO) of Acumen Fund, a social venture capital fund, does not run out of anecdotes, or patience, to explain what patient capital means for an impact investor like her. In an interview in October, ahead of the TED (technology, entertainment and design) conference she was to attend in Mysore, Novogratz cited the example of Noida-based D.light Design Inc., one of her portfolio companies. D.light makes Nova, a low-cost, solar-rechargeable portable LED (light emitting diode) lamp for the poor, an alternative to kerosene lamps that are expensive, hazardous, polluting and produce low-quality light. When D.light first started, it was trying to figure out how to convince people to buy LED lights instead of kerosene lamps. So it gave a woman running a shop selling samosas outside its office in Noida an LED light for a 30-day free trial. D.light officials visited her daily and at the end of the month found that her sales had doubled because there were no fumes or lingering smell—common problems with kerosene lamps—to put off customers. But when they asked her whether she would like to buy it, she said no. “We thought what does this mean?" remembers Novogratz. “And the problem was she had no trust because why should she trust us when the whole world had given her low-quality things and had not been there for her?" The only reason the woman had agreed to take the LED light in the first place was because she had thought they had taken pity on her! So you think it’s a new technology and it’s cheap and people will actually buy it, but it’s not true in markets where people are not viewed as consumers, explains Novogratz. “This was a big insight to me on why patient capital in energy (is needed). Here it shows why it takes long and it is not that hopeful." So far, Acumen Fund has invested $35 million (Rs165 crore) worldwide and has a mandate of committing Rs30-50 crore every year in India. Though the amount is meagre compared with the investments made by venture capital firms today, it has managed to attract the attention of reputed businessmen in India such as Nandan Nilekani, former co-chairman of Infosys Technologies Ltd and now chairman of the Unique Identification Authority of India, and G.V. Prasad, vice-chairman and CEO of Dr Reddy’s Laboratories Ltd.
“We have donors from 18 countries and I just came from Dubai and Egypt where we signed around five or six people to invest anywhere between $10,000 to $100,000," adds Novogratz. These funds are then invested in private companies as early-stage capital in the form of equity or debt. The only, but crucial, difference—for the entrepreneur, social impact must be primary and profit or financial impact secondary. Whatever profit Acumen earns is reinvested in other companies. However, the success rate of such ventures can be low, forcing many of them to deviate from the original goal. Some of Acumen’s portfolio companies have been no exception to this. “It’s not ever going to be perfect, but you find entrepreneurs whose moral compass you trust," says Novogratz. She writes off such experiences as failures that have only made her business acumen “more sharp". Acumen has invested in sectors such as renewable energy, healthcare, water and agriculture. Its portfolio companies include LifeSpring Hospitals Pvt. Ltd, a maternity hospital for low-income women; Global Easy Water Products Pvt. Ltd, a provider of low-cost irrigation solutions for farmers; and Ziqitza Healthcare Ltd, which started an ambulance service called Dial 1298 for Ambulance. While she refuses to name any favourites among Acumen’s Indian portfolio, Novogratz does mention that Dial 1298 could be a model for delivery of emergency medical services not just in India, but also globally. Acumen currently is close to announcing another deal in India in the healthcare sector. A group led by Acumen Fund, and philanthropic organizations such as Salesforce.com Foundation and Skoll Foundation, is working on developing a system to measure the impact of such social venture investments. Called the “Portfolio Data Management System", it will track the tangible aspects that can be measured, she explains. Novogratz also plans to have a benchmarking process for her investments. “So if I see a difference in a venture in Pakistan compared to a similar venture in Kenya, I can actually point out if the difference is because of land mass, labour, or bureaucratic red tape."